When Dee finally summons the courage to make a deal with one of these devils, she finds it may be more than she bargained for. The demon she approaches quickly informs her that he doesn't trade in the usual appendages, he's only interested in her heart. He'll put her body in a kind of stasis for two years, and she'll become part of his crew of "heartless"--teen soldiers sent to the demons' home world to fight their enemies. All of the heartless have their reasons for making this deal, but it begs the question: what are you willing to give up to achieve your heart's desire? --SLJ "[Entertaining] and unpredictable. An action-packed adventure with a charming criminal crew." --Kirkus Praise for Illusive and Deceptive *"Boasting a complex plot, heart-stopping bursts of action, and questions regarding human nature, Lloyd-Jones' thought-provoking, multifaceted narrative neatly sidesteps categorization as just another superhero or dystopian novel--though fans of both will be drawn to the material and be pleasantly surprised. An impressive debut guaranteed to disappear from the shelves before your very eyes." 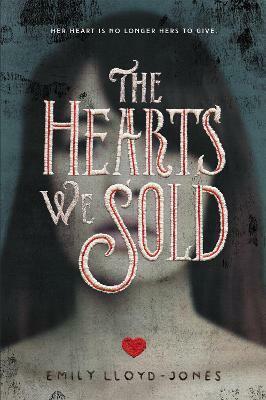 --Booklist (starred review) "With its lush, Lovecraftian worldbuilding and a heroine as tough as she is damaged, The Hearts We Sold sucked me in and held me captive. I finished it in one sitting!" --Gretchen McNeil, author of Ten and the Don't Get Mad series "One of those unassuming reads that quietly sneaks up on you--and before you know it you've been blindsided by how awesome it is... The message in the philosophical prose is understated, but powerful, as is the surprise ending. With wonderfully developed characters, an engaging storyline and a romance that will steal readers' hearts, The Hearts We Sold is a story that's easy to love." --Romantic Times Praise for The Hearts We Sold * "Beautifully written and elegantly characterized, this is a thoughtful, melancholy tale of love and redemption, magic and choice. Lloyd-Jones tracks Dee's Faustian journey without ever falling out of step, and the story itself will ensnare readers as surely as any bargain." --Booklist (starred review) "Lloyd-Jones's take on the Faustian myth will keep readers engaged. A broad array of well-developed characters will intrigue readers as the plot advances and curves. Offers character depth and diversity often lacking in the fantasy genre." --SLJ "The slowly revealed lore of the demons coupled with Dee's adventures make for a whirlwind of a page-turner. Readers will devour this romantic, Faustian fable. A dark fantasy brimming with passion and peril." --Kirkus Reviews "With its lush, Lovecraftian world building and a heroine as tough as she is damaged, The Hearts We Sold sucked me in and held me captive. I finished it in one sitting!" --Gretchen McNeil, author of Ten and the Don't Get Mad series "A completely original story that shatters the boundaries of YA fiction. Magic, mystery, and intrigue, paired with Jones's devilish story-telling ability, will bind readers to The Hearts We Sold until the final explosive ending." --Lindsay Cummings, #1 New York Times bestselling author of Zenith and The Murder Complex Praise for The Hearts We Sold "The slowly revealed lore of the demons coupled with Dee's adventures make for a whirlwind of a page-turner. Readers will devour this romantic, Faustian fable. A dark fantasy brimming with passion and peril." --Kirkus Reviews "The characters are spunky and compassionate, and teen readers will love the storyline." --School Library Connection "An inventive, heart-wrenching thrill ride." --Kim Liggett, author of Blood and Salt Praise for The Hearts We Sold "A completely original story that shatters the boundaries of YA fiction. Magic, mystery, and intrigue, paired with Jones's devilish story-telling ability, will bind readers to The Hearts We Sold until the final explosive ending." --Lindsay Cummings, #1 New York Times bestselling author of Zenith and The Murder Complex Praise for The Hearts We Sold: "The characters are spunky and compassionate, and teen readers will love the storyline."